Put Some Prep in Your Step!! I have recently proposed a clean eating challenge to my clients. Some of my friends are jumping on board as well. TOMORROW is day 1 of 21…Monday. It’s a new start, a new beginning. Here we go. It’s Sunday night, and I spent the evening working on client’s programs, writing classes for Barry’s Bootcamp for the week, making paleo donuts (coming soon) to get rid of the chocolate in my house in preparation for the challenge, and prepping food for the next few days. I thought it would be interesting for me to share a few of my meal preps for the challenge with you guys! It just makes everything easier and leaves no excuse to not eat clean. I’m looking forward to this little challenge, and looking forward to seeing how everyone does. I’m not a fan of “diets.” I’m not a fan of restricting unless you have an allergy. If you want to eat something, there’s usually a reason why… Now, you have to look at those reasons why sometimes – is it because you’re bored, lonely, or do you really want that piece of chocolate cake with cherries on top? If the answer is yes, then why not have a little? Let me clarify – the “cheat” meals… They aren’t – go to McDonalds and eat all you can or binge on sugar until you puke. The author teaches you what a clean protein and carb is verses a “cheat” protein and carb. It’s actually pretty interesting. When I went shopping for the grocery list, it was VERY similar to what I already get weekly so I was quite happy with that. 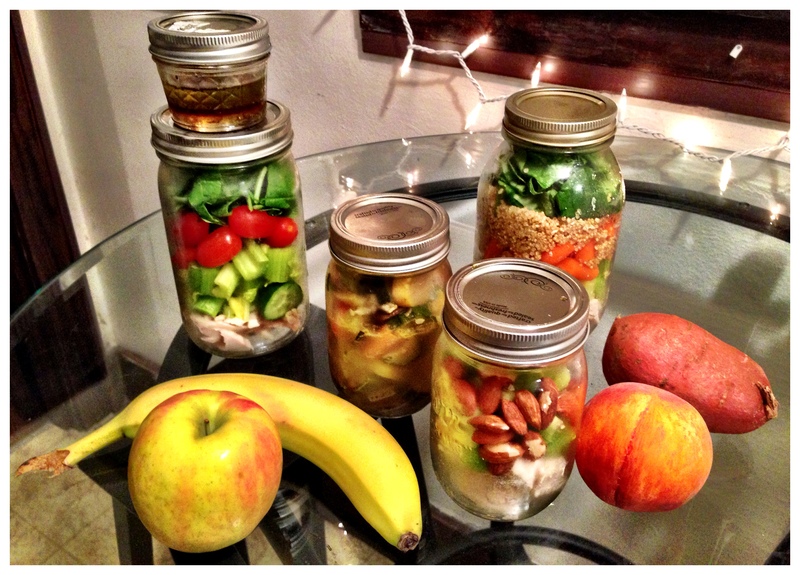 As you can see above, I prepped a few of my meals for the next few days in mason jars. The jars are cheap, fun, pretty, and keep things fresh and ready to go! You can find mason jars at Michaels, Kroger, Walgreens sometimes – they are readily available down south. Yeehaw. As for my jars – I’ll go from left to right with just a little description of the ingredients. (Sorry I didn’t take more pics – my phone is literally out of space.) I’ll go from bottom to top of the jars. Also, I love onions, but they hurt my belly, so you’ll notice I rarely, okay – I NEVER use onions in my recipes, so always feel free to add some onions in for flava if that’s your thing! I use this dressing for everything. Sometimes I’ll change up the vinegar depending on the ingredients of my salad, but you just cannot go wrong making your own dressing. You know exactly what’s in it and can add a little more of this and a little less of that based on taste. Feel free to adjust the ingredients. This makes a lot of dressing, so you might want to cut the recipe in half. For this one – I’ll empty the ingredients of the jar, add the dressing and either eat it as is, add a little spinach or stuff it in a tomato! If you go the tomato route – clean out the inside of the tomato and place the chicken mixture in the middle. It makes for a beautiful, simple and healthy dish! To keep prep time down – I buy the simply roasted chicken at Trader Joe’s and the sliced turkey there as well, and there’s zero prep needed for that – just slice and eat. Spending a little time on Sunday getting these ready will really help my (and your) days stay smooth. Having these meals prepped and ready will leave me (and YOU!) no excuse to NOT eat healthy. So, there you have it! Just put some prep in your step!!!! Dump these jars of love into a bowl, top with dressing and pepper and BOOM – you’ve got a bowl of clean, healthy, guilt-free, you-love-your-body, amazing fresh food! !